Come 3 – 6 March 2017, Kidney Dialysis Foundation (KDF) will held its annual KDF Millennium Ride 2017 for the 4th year organised by Epic Cyclists. Over 70 cyclists will be participating in the KDF Millennium Ride and riding 1000km in four days to raise funds for the Kidney Dialysis Foundation (KDF). Held since 2014, the annual KDF Millennium Ride is organised by Epic Cyclists, a local cycling group, and known as one of the most physically and mentally demanding rides in the region. Cyclists will endure at least 8 hours of cycling to complete a distance of 250km each day through various types of terrain and weather conditions from Malaysia to Singapore. “The big challenge for this year is climbing equivalent of one Mount Everest in first 2 days of our ride over 470km. Challenges even for a pro-cyclist, but these are ordinary people making a commitment to do such a daunting task. The hours and the mileage each cyclist got to put in prior to the 4 Days is extensive. However, the obstacles our cyclists will encounter cannot be compared to the adversity dialysis patients go through daily. It is heartening to witness our cyclists putting in the effort to help raise funds for a good cause,” said Mr Clifford Lee, founder of Epic Cyclist. 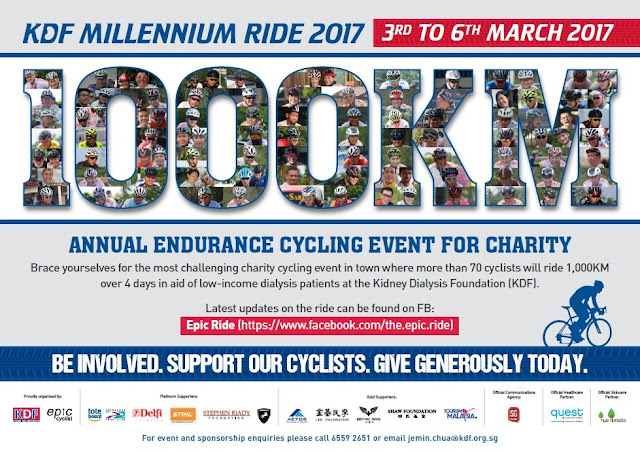 In 2016, A total of S$590,634.53 was raised through KDF Millennium Ride this year after the 40% matching by the Community Silver Trust Funds at 40%.This year, Epic Cyclist hopes to raise at least $300,000 in 2017 for the less fortunate who requires dialysis treatment. This year, will be the 2nd year Chubby Botak Koala and Little Devil will volunteer as Safety Drivers to somewhat contribute to the welfare of the Epic Cyclists. With this, we hope that to raise more awareness and share the passion and mission of helping KDF patients. All proceeds from the donations will be channelled to needy kidney patients under the care of Kidney Dialysis Foundation. Members of the public can donate via this link at https://www.giving.sg/kidney-dialysis-foundation/mride17. Thank you very much for your generous contributions and support. Please pray for us for the success of this event.